Professor Christensen teaches courses in Greek Epic and Archaic Poetry; Rhetoric and Literary Theory; Linguistics; Mythology. Joel Christensen is Associate Professor in the Department of Classical Studies. He taught previously at the University of Texas at San Antonio (2007-2016). He received his BA from Brandeis (’01) in Classics and English and his PhD in Classics from New York University (2007) with a dissertation entitled "The Failure of Speech: Rhetoric and Politics in the Iliad", for which he was awarded NYU’s Lane Cooper Fellowship for 2006-07. He also received an Advanced Certificate in Poetics and Theory. Professor Christensen has been a Fellow at the Center for Hellenic studies and has received the Society for Classical Studies’ Award for Excellence in Teaching at the Collegiate Level (2013). He has published articles on the use of language in Homer and the relationship between our epics and mythopoetic traditions and is currently working on a book on the Odyssey and modern psychology. 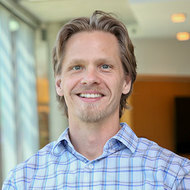 Professor Christensen also collaborates on several research and pedagogical projects. In addition to a half-dozen articles, Professor Christensen and Elton T. E. Barker (Open University, UK) have published a "Beginner’s Guide to Homer" (One World, 2013) and will publish their second book ("Homer’s Thebes: the Appropriation of Epic Pasts") with the Center for Hellenic Studies in 2019. Professor Christensen published on Ancient Leadership in the Classroom with Eli Embleton (2016) and has recently completed a commentary on the Homeric "Battle of Frogs and Mice" with Erik Robinson (Bloomsbury, 2018). Professor Christensen spends his 'off' hours posting material to the Classics-oriented website www.sententiaeantiquae.com and tweeting about it (@sentantiq); he also serves as the book review editor for The Classical Journal. Christensen, Joel P.. "Eris and Epos: Composition, Competition and the ‘Domestication’ of Strife.." Yearbook of Ancient Greek Epic 3. (2018): 1-39. Christensen, Joel P.. "Human Cognition and Narrative Closure: The Odyssey’s Open-End.." The Routledge Handbook of Classics and Cognitive Theory. First ed. Ed. Peter Meineck. Routledge, 2018. 139-155. Christensen, Joel P.. "Learned Helplessness, the Structure of the Telemachy and Odysseus’ Return." Psychology and the Classics. 1 ed. vol. 1 Ed. Jeroen Lauwers, Jan Opsomer and Hedwig Schwall. Leiden: Brill, 2018. 129-141. Christensen, Joel P.. "Speech Training and the Mastery of Context: Thoas the Aitolian and the Practice of Múthoi." Homer in Performance: Rhapsodes, Narrators and Characters. 1 ed. vol. 1 Ed. Christos Tsagalis and Jonathan Ready. Austin: University of Texas, 2018. 255-277. Christensen, Joel P.. "The Clinical Odyssey: Odysseus’ Apologoi and Narrative Therapy." Arethusa 51. (2018): 1-31. Christensen, Joel and Robinson, Erik. The Homeric Battle of Frogs and Mice: Introduction, Translation and Commentary. 1st ed. London: Bloomsbury, 2018. Christensen, Joel and Barker, E. T. E.. "Odysseus’ Nostos and the Odyssey’s Nostoi." Studies on the Greek Epic Cycle. 1 ed. vol. 1 Ed. G. Scafoglio. Rome: Philologia Antiqua, 2015. 87-112. Christensen, Joel. "Diomedes’ Foot-wound and the Homeric Reception of Myth." Diachrony. 1st ed. vol. 1 Ed. Jose Gonzalez. Leiden: De Gruyter, 2015. 17-41. Christensen, Joel. "Time and Self-Referentiality in the Iliad and Frank Herbert’s Dune." Classical Traditions in Science Fiction. 1 ed. vol. 1 Ed. Brett Rogers and Benjamin Stevens. London: Oxford, 2015. 161-175. Christensen, Joel. "Trojan Politics and the Assemblies of Iliad 7." Greek, Roman and Byzantine Studies 55. 1 (2015): 25-51. Christensen, Joel and Barker, E.T.E.. "Even Herakles Had to Die: Epic Rivalry and the Poetics of the Past in Homer’s Iliad.." Trends in Classics 6. 2 (2014): 249-277. Christensen, Joel and Barker, E.T.E.. Homer: A Beginner's Guide. 1st ed. London: One World, 2013. Christensen, Joel. "Innovation and Tradition Revisited: The Near-Synonymy of Homeric ΑΜΥΝΩ and ΑΛΕΞΩ as a Case Study in Homeric Composition." The Classical Journal 108. 3 (2013): 257-296. Christensen, Joel. "Ares: ἀΐδηλος: On the Text of Iliad 5.757 and 5.872." Classical Philology 107. 3 (2012): 230-238. Christensen, Joel and Barker, E.T.E.. "On Not Remembering Tydeus: Agamemnon, Diomedes and the Contest for Thebes." Materiali e Discussioni per l'Analisi dei Testi Classici 66. 1 (2011): 9-44. Christensen, Joel. "First-Person Futures in Homer." American Journal of Philology 131. 4 (2010): 543-571. Christensen, Joel. "The End of Speeches and a Speech’s End: Nestor, Diomedes, and the telos muthôn." Reading Homer: Film and Text. 1st ed. vol. 1 Ed. Kostas Myrsiades. New York: Farleigh Dickinson University Press, 2009. 136-62. Christensen, Joel and Barker, E.T.E.. "Oedipus of Many Pains: Strategies of Contest in the Homeric Poems.”." Leeds International Classical Studies 7. 2 (2008): 1-17. Christensen, Joel. "Flight Club: The New Archilochus Fragment and its Resonance with Homeric Epic." Materiali e Discussioni per l'Analisi dei Testi Classici 57. 1 (2006): 19-43.